Announcement Thank you for visiting Skyline Soapworks! Feel free to take a look around and please convo me with ANY questions! Thank you for visiting Skyline Soapworks! Feel free to take a look around and please convo me with ANY questions! I am a big fan of bath bombs and soaking in the tub. These surely did not disappoint. They created a very nice soak. I would definitely purchase again. Order turnover was prompt and efficient. Getting ready to move in two weeks! Jack Frost Soap - January’s Soap of the Month! Freshly poured, and so beautiful! Hello! My name is Jennifer. I am the mother of two beautiful and ENERGETIC little boys and a high school science teacher. I strive to keep busy and truly have a love of all things "crafty". I've lived in Virginia's Shenandoah Valley since August of 2003 and am so grateful to be able to raise my boys here. Skyline Soapworks is actually the reincarnation of a business that I started back in 2002 while living in Central NY. I think soap making originally intrigued me because it was the perfect combination of two things that I love, science and art. I fell in love with the craft immediately and went all in! Once I moved to Virginia (in the days before Etsy! ), I picked up and continued to find local business's interested in carrying my product. During this time, I started a new career and my family, and felt that I needed to take a break from my craft. Fast forward to 2013. I had been battling sensitive skin issues pretty much since moving to VA and noticed my oldest son begin to develop the same problems. The solution was clear! To again create the same skin loving products that I used to! My style has evolved and my ingredients have changed, but my focus remains the same. To create a little bit of luxury to love and feed your skin. Everyone deserves a little something to pamper themselves with and I believe that my products definitely serve that purpose! I invite your to browse through my shop and by all means contact me with ANY questions you may have. Our products are always changing as soaps cure and new items are created. I hope to continue to expand our product line and would love the opportunity to create specialty items for my customers and even see my products in retail shops! Thank you so much for your interest! Skyline Soapworks specializes in exquisite body care that is hand made in the shadow of the Blue Ridge Mountains. Our soaps are formulated to be mild and creamy using oils such as avocado oil, olive oil, cocoa butter, and shea butter. Most bars contain real cream, goat milk, coconut milk, and/or buttermilk, as well as luxurious silk to enhance your bathing experience. Our soaps may contain colorants and fragrance/essential oils. The ingredients of all of our soaps are clearly labeled and may contain ingredients that cause skin sensitivity or allergic reactions in some individuals. Do not use if you are sensitive or allergic to any of these ingredients. If you are pregnant or suffer from a medical condition, please consult your physician before using any product containing essential oils. CARING FOR YOUR SOAP To increase the life of your handmade soap, keep in a well-drained soap dish and allow to dry between uses. Never leave soap standing in water or in a direct stream of water. Handmade soap contains naturally occurring glycerin which is removed from store bought soaps (detergent bars). Glycerin is a humectant, meaning it draws moisture to itself. Due the fact that soap is a personal product, I do not accept returns. If you are unsatisfied with your purchase, please contact me so we can discuss an appropriate solution. I will not refund the purchase cost based on personal taste, such as scent, color, or texture. I do my best to accurately describe the scents based on my personal opinion and on the descriptions provided by the fragrance oil and essential oil manufacturer, but remember that every nose is different and scents may be perceived differently per person. Our soap recipes have been developed with our family's dry/sensitive skin in mind. My goal has always been not to have just a cleansing soap, but a soap that feel luxurious on the skin as well. Not only do different people have different skin types, but even differences in the water we use (hard/soft; town/well) will affect the performance of the soap. Please be aware of your allergies while researching the ingredient list for each item. 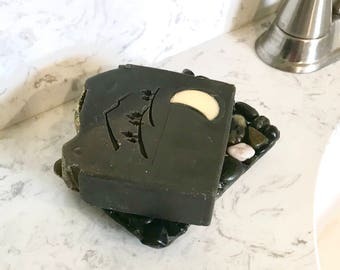 While our soap is formulated to be a mild, long lasting bar, there is always the possibility of allergies even with the purest essential oils and fragrance oils. If you develop any sensitivities to any of the products please discontinue use immediately and seek medical attention if necessary. I accept all major credit cards, debit cards, and Etsy gift cards, as well as Paypal. Our products are shipped via USPS flat rate Priority mail within 1-3 business days. Shipping costs will be adjusted for combination orders and overpayments greater than $1.00 USD will be refunded. All cancellations must be received via email within the initial 24 hours of your order and prior to the order being mailed out. Our soaps are handmade from scratch in small batches making every batch and bar uniquely special. Variations in soap design, color and scent are expected and do not constitute a substantial flaw in the product. Our soaps are formulated with a wide variety of natural ingredients known for their reputed benefits. However, our products are not intended to diagnose, treat, cure, or prevent any medical condition. Custom orders and other inquiries are welcomed and may require special arrangements. Please convo us for specifics. If you live outside of the US, please contact me for postal rates before ordering. If you have ANY questions, please do not hesitate to contact us! Thank you so much! To fulfil your order, you must provide me with certain information (which you authorized Etsy to provide to me), such as your name, email address, postal address, payment information, and the details of the product that you’re ordering. You may also choose to provide me with additional personal information (for a custom order of soap, for example), if you contact me directly. For purposes of EU data protection law, I, Jennifer Anderson, am the data controller of your personal information. If you have any questions or concerns, you may contact me at skylinesoapworks [!at] gmail.com. I love working to design and create your perfect soap or other body product. Please contact me via convo to see what we can create together! I do accept wholesale orders. You may email me personally at skylinesoapworks@gmail.com for more information or find me on Etsy Wholesale. I also offer whole, uncut soap loaves, and will consider private label for an extra fee. What is cold processed soap? Cold processed soap is soap in its truest form. True soap is created from the chemical reaction that occurs when combining a lye (sodium hydroxide) with oils & butters (vegetable or animal) and water. This chemical reaction is called "saponification" and transforms these ingredients into a salt that we call soap. Commercial soap manufacturers remove the naturally formed glycerin by-product from soap to add to other products. This is why so many commercial soap products strip your skin leave it feeling dry. Handcrafted soaps also contains no chemical detergents. Only products created through the saponification process of combining lye, water and oils can be labeled and sold as "Soap".